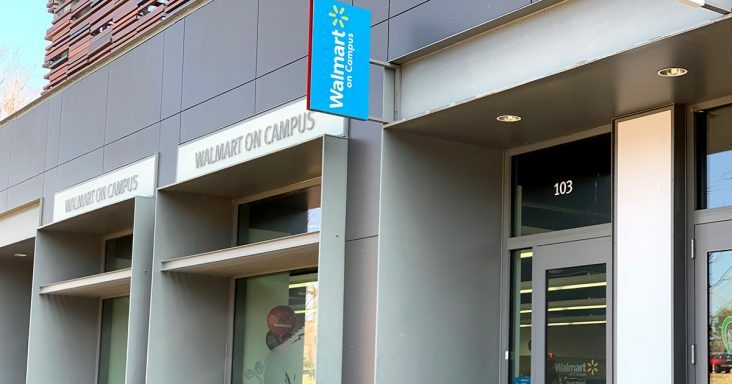 Walmart Inc. unveiled its revamp of the Walmart On Campus store at the University of Arkansas this week after an extensive remodel and the addition of a pickup lockers, which flank the store’s entire back wall. The campus store is one of four across the country that was introduced in 2011. They were later retained when the small-format Walmart Express stores were closed by in early 2016. At just 3,371 square feet, the small format offers a wide assortment of more than 2,500 items from fresh fruit to toothpaste, and even minor hardware items like Command hooks and bungee cords. During the recent revamp, the store tweaked its item displays to reduce the number of items in some categories like deodorant to add more fresh items and expand the freezer and refrigerated sections of the store. For more convenience, the store also converted one of the two manned checkout stations to a self-checkout lane. The store is also equipped with a complete pharmacy that delivers medications on campus twice daily. Store manager Randy Sterling said the display modulars in the store were also lowered to give shoppers better sight lines throughout the store. The carpet was taken up and the concrete polished, which Sterling said is more durable and easier to clean. He said the new pickup locker system and self-checkout are designed to reduce customer wait time in the store. Sterling said the new locker pickup system allows students of faculty to order from Walmart.com or from area stores with a pickup designation at the campus store. The system works like the giant pickup vending machines found in most stores across the region. The customer simply scans an email code into the monitor on the locker bank and verifies the identity and the locker drawer will open. Sterling said store employees load the merchandise into lockers the same way by scanning a code and selecting the drawer size. Also new to UA campus students and faculty is grocery delivery to dorms or offices when ordered online. The customer uses the Walmart grocery app, enters a zip code and begins creating a shopping list. During checkout, they select a time for their order to be delivered and pay the $9.95 delivery fee. No money is exchanged at the customer’s door. Sterling the two local stores doing the fulfillment of grocery orders to the UA campus are the Neighborhood Market and Supercenter, each located on Martin Luther King Jr. Boulevard, in close proximity to the campus. Walmart is using a third-party partner to pick up the orders and deliver to the customers on campus within a one-hour window of the chosen delivery time. Walmart said customers can get their first delivery free by using the promo code FRESHCAR with a $50 minimum order. Walmart On Campus is not without its operational challenges, but Sterling, who opened the store in 2001, said it’s worth the work given the importance of serving the college demographic. With no back room to hold overflow inventory, Sterling said keeping the shelves stocked is one of the most challenging operational aspects. He said the tiny store gets deliveries from distribution centers just about every day. There is no truckload delivery option. Deliveries are made by small trucks that can handle temperature controlled items in addition to general merchandise. The store is open from 8 a.m. to 10 p.m. Monday through Friday. On Saturday, the hours are 10 a.m. to 10 p.m. and on Sunday it’s 1 p.m. to 10 p.m. Sterling said he has a total staff of less than 20, which includes the pharmacist and several techs. He said the staff is a combination of part-time and full-time, more part-time of which all are UA students. He has one full-time support manager who is a UA graduate and two part-time support managers who help run the store. Sterling said the store is merchandised around what students need and want — single-serving foods, personal care items and other essentials such as laundry detergent. He said the prices are identical to those at area Supercenters, as there is a markup of slower-moving items as in traditional convenience formats. The store also carries greeting cards, gift cards, school supplies and a small selection of UA apparel. Sterling would not say what the store customer count is daily, but during the hour or so a reporter was in the store, there was a steady stream of customers walking in to purchase one or two items and be on their way.